Oh yeah, it was just like this. Dad worked for Shell Oil Company so we moved a fair amount when I was younger; mostly back and forth between Texas and Connecticut. The family started in Alton, Illinois, Dad’s first stateside assignment after WWII. Both Dale and I were born there. Then on to Pasadena, Tx, up to Southport, Ct, back to Pasadena, back up to Stamford, CT and finally back to Houston, Texas. Shell paid most if not all of the moving expenses, yes they did that back then, so Mom and Dad would hire a moving company to pack and ship all our stuff. 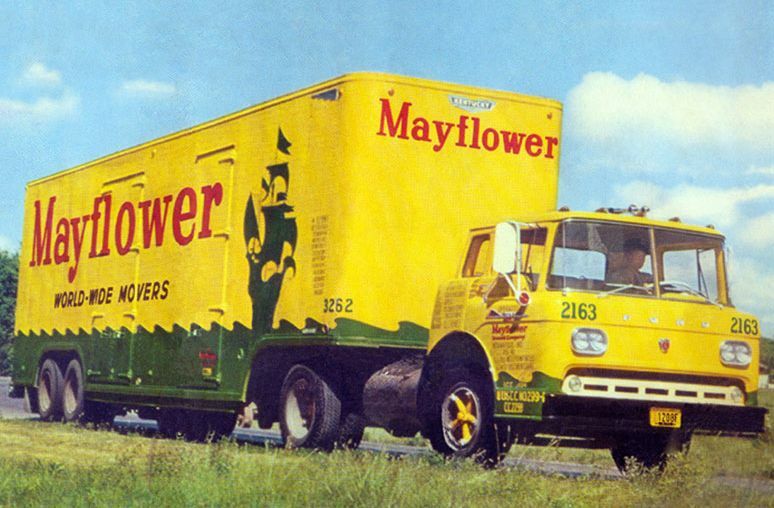 They used several different companies over the years but the only one I really remember was Mayflower. I can still visualize that big yellow truck showing up at our house, backing into the driveway without taking out any trees (how do they do that! 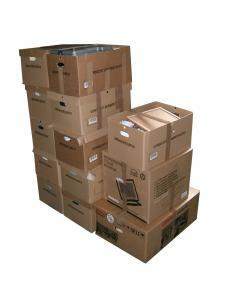 ), and the team of movers who then took over the house in a flurry of packing and moving activity. What a spooky feeling. This was our home but we didn’t belong there anymore. I don’t remember how long we lingered in the empty house, securing everything and double checking that nothing was left behind, I imagine it varied with each move. Then on to a local hotel for a few nights so Mom and Dad could wrap up all the loose ends involved in moving: shutting off the utilities, clearing bank accounts, saying their goodbyes. When that was done, we all jammed into the station wagon and began the drive to our new home. For at least one move my parents shipped us off to summer camp so Mom wouldn’t have to deal with kids and the move. I thought it was clever but Dale, who was older, may have been less amused. 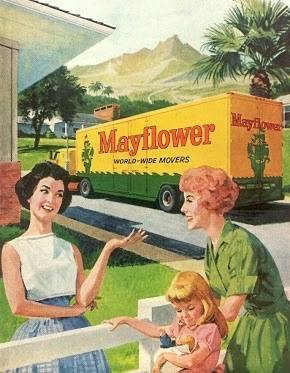 Moving was exciting and scary, especially since I was pretty shy about meeting new people back then. Starting over in a new house was kind of fun, making new friends not so much. The hardest move for me was leaving Stamford and the friends I basically grew up with and going back to the dreaded Texas. Yes, I said it, I hated Texas because of my bad experiences in Pasadena but that is another story. Dad and I drove alone that trip, Mom had gone ahead to set up house and Dale, I think, was up in Rochester. Dad, me, our dog Tippy, and the two cats: Scooter and Card. Card yowled the entire way and almost drove Dad insane. I had fun in spite of the stress, mostly because I just like road trips. Any kind of road trip. Eating in restaurants along the way, staying in hotels. What could be better?